Is Highland Park the next Restaurant Row? Worldwide icon-chevron-right North America icon-chevron-right United States icon-chevron-right Illinois icon-chevron-right Chicago icon-chevron-right Is Highland Park the next Restaurant Row? A glut of new openings made us wonder if the north suburb could be the next big eating destination. With the help of Highland Park native Jill Weinberg, we came up with five reasons why it very well could be. 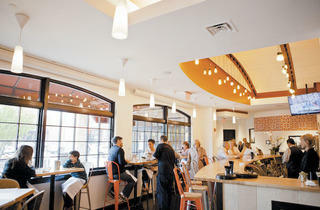 Photograph: Allison Williams An interior view of Moderno restaurant in downtown Highland Park. 1 It has a travel-worthy burger. Recently opened restaurant Benjamin (1849 Second St, Highland Park, 847-748-8737) serves thin slices of beef tongue with housemade giardiniera, and cedar-roasted salmon with yuzu-marmalade. But everyone comes here for the Benjamin Midwestern Wagyu beef burger, a monster of a sandwich that features caramelized red onions, thick bacon, smoked Gouda, heirloom tomato and—the burger’s best feature—Merkts cheddar cheese. 2 It’s attracting big-name chefs. 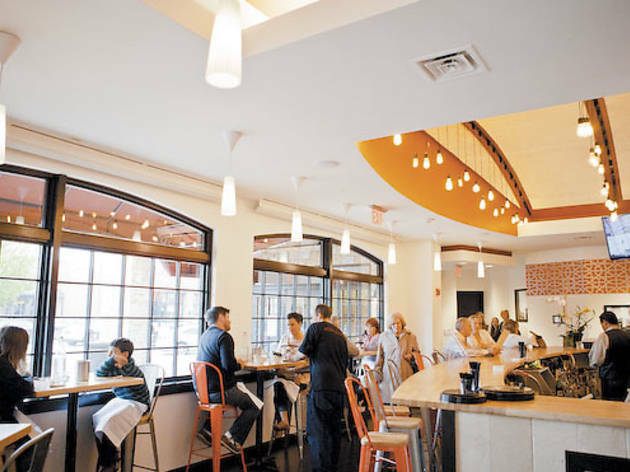 A few weeks ago, John des Rosiers opened his first HP spot, Moderno (1850 Second St, Highland Park, 847-433-8600). If you don’t know Des Rosiers, it’s because you don’t live in Lake Bluff, where his flagship restaurant, Inovasi, is located. But trust us—he’s a big name in the ’burbs, and a growing name in the city. Des Rosiers isn’t the only chef HP is attracting: Coming soon is In the Raw, a raw-foods restaurant that is “in partnership” with renowned chef Matthew Kenney. Is it a coincidence that both Menchie’s (1929 Sheridan Rd, Highland Park, 847-780-4930), the pay-by-weight fro-yo chain from L.A., and Frost (617 Central Ave, Highland Park, 847-432-2233), the gelato chain from Arizona, both chose to open their first Illinois shops in Highland Park? Maybe. Or maybe HP residents are just crazed for icy sweets. Either way, the ’burb is first with frozen. 4 It’s on top of the barbecue trend. While Chicago was losing its mind over Lillie’s Q, Smoque and (to some degree) Chicago Q, Highland Park was focusing on its own ’cue: Real Urban Barbecue (610 Central Ave, Highland Park, 224-770-4227). Two Big Green Egg smokers outside the place suggest these guys aren’t messing around; the burnt-ends sandwich proves it. 5 It’s experiencing a sweets war. Last spring, Turtle’s Cupcakes (469 Central Ave, Highland Park, 847-748-8627) opened in Highland Park’s downtown. A month later, Marla’s Sweet Bites (478 Central Ave, Highland Park, 847-432-4440) opened across the street. Both have stayed in business so far (though Marla’s recently cut its retail hours to weekends only), but neither is in the clear yet: Highland Pop (464 Central Ave, Highland Park, 847-433-4200), a Garrett-like popcorn shop, opened on the same block earlier this year.